On Sunday night I led our monthly praise and worship night which gives an opportunity for anyone to share what they believe God may be saying to us all. My friend and fellow Baptist minister joined us for the evening. I asked him to bring some words from God’s heart, specifically for people’s healing. The words he brought were spot on and people responded to the words. 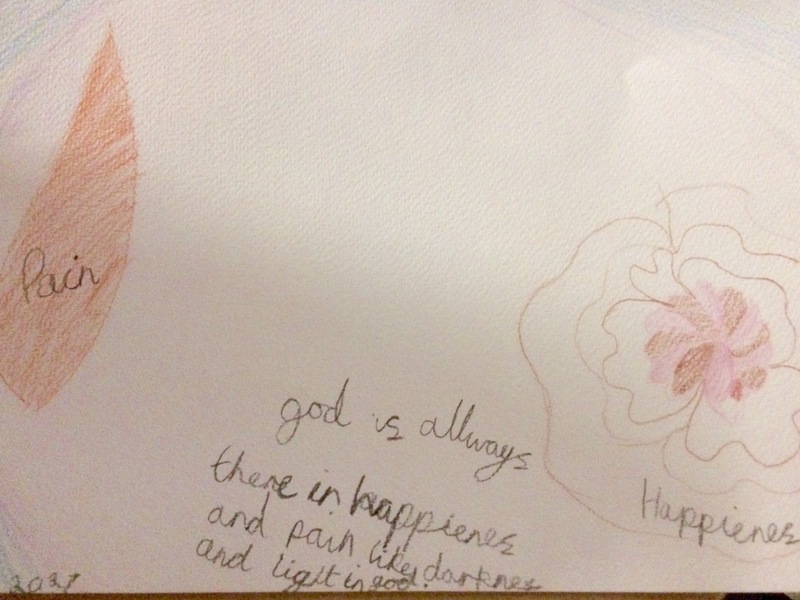 But it was right at the end when a nine year old girl brought a prophetic picture that really blew me away. At first glance it looks like it has seperate bits to it, like doodles. The red on the left represents blood, with the word pain written on it. On the right is happiness. At the event was a man who had been in great pain in the week when he had a bad nose bleed. The drop of blood and pain resonated with him. The man felt so happy to recieve the picture and after praying for him he felt so much better knowing that he was known by God.